I recently revisited one of my all-time favorite books, The Professor and the Madman by Simon Winchester. Years ago, when I first discovered the book, I raved about it to anyone who would listen. “You HAVE to read this book,” I’d implore. “What’s it about?” they’d ask. “It’s about the making of the Oxford English Dictionary,” would be my enthusiastic reply, whereupon I could immediately sense a kind of let-down, as if they were saying You’re kidding, right? A story about a dictionary? Why not a telephone book? My reply was “Trust me, there’s more to it than just the dictionary and you won’t be able to put it down… You’ll wish it would never end.” My would-be converts assured me that they would check it out and off they scampered, every bit of their body language saying, Not a chance. I even gave the book to a number of people and those who took the time to read it and get back to me shared my unbridled enthusiasm. I won’t give away anything about the story, though a quick look online will spill the beans on the plot, but the “madman” of the story is a gentleman by the name of William Chester Minor who was born in Ceylon (now Sri Lanka) to Congregational missionary parents from New England. Back when I first read the book, not yet having discovered genealogy, I took little more than passing note of the biographical details that Mr. Winchester included on his way to the exhilarating main plot. This time around, I couldn’t help but be intrigued by Mr. Minor’s ancestry, and as compelling as his personal story is, his family story, genealogically speaking, is also worth telling. Descended from an esteemed Connecticut family, William Chester Minor’s roots are so firmly planted in New England that his great-great-great-great-great-grandfather, Thomas Minor, as well as Thomas Minor’s father-in-law, Walter Palmer, are among those first immigrants for whom Robert Charles Anderson has written sketches for his Great Migration Study Project. Baptized on 23 April 1608 in the village of Chew Magna, Somerset (not too far from Bath), Thomas Minor arrived in New England in 1632, settling first in Charlestown, where, in 1634, he married Grace Palmer, the daughter of Walter Palmer (abt. 1589–1661), whose origins are unknown but who was “admitted as an inhabitant of Charlestown” in 1629. Palmer removed to Rehoboth and then to Stonington, Connecticut, and is counted as one of the founders of that town. Thomas Minor went from Charlestown to Hingham, then to New London and, by 1655, to Stonington, becoming another of the town’s first settlers. Thomas and Grace had ten children – seven sons and three daughters – nine of the ten born before their arrival in Stonington. Thomas is remembered, too, as a colonial diarist, having chronicled his activities as a farmer for thirty-one years, from 1653 to 1684. Providing a rare glimpse into seventeenth-century daily life, the diary was published by his descendants in 1899. Thomas is remembered, too, as a colonial diarist, having chronicled his activities as a farmer for thirty-one years, from 1653 to 1684. But back to the future. William Chester Minor was the son of Eastman Strong Minor, the son of Eastman Minor (1783–1825) and Eunice Strong (1787–1849), the daughter of Ephraim Strong, a Milford farmer, and Hannah Platt. 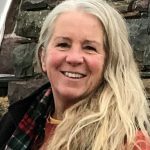 To the Minor family tree, Eunice Strong introduces yet another ancestry with deep New England roots, one reaching back to Elder John Strong, who settled in Northampton, Massachusetts after arriving in 1635 on the Hopewell. Eunice descends from John’s son, Thomas, and his second wife, Rachel Holton. Eastman Strong Minor, born in Milford, Connecticut in 1809, was first married to Lucy Bailey, who was born in New Hampshire in 1809. Both were devout Congregationalists whose faith challenged its followers to give their time and talents to the preaching of the Christian gospel. A successful printer by trade, Eastman S. Minor had charge of the office of the Religious Intelligencer (1816–1837), a New Haven-based evangelical magazine published weekly to disseminate news about the work and progress of American Bible and missionary societies. Shortly after their marriage, the American Board of Commissioners for Foreign Missions – chartered in 1812 by New England Congregationalists who established the American Ceylon Mission at Jaffna in 1816 – sent Eastman and Lucy to Manepy, one of eight stations in the Jaffna District, on the northern peninsula of Ceylon. They sailed from Salem, Massachusetts on 29 October 1833 and arrived there in March 1834. Each year, eight million pages of the Christian message were produced for the eight stations, an indispensable adjunct to the Mission’s preaching, schools, and hospitals. A printing press had recently arrived at Manepy to produce Christian literature in English as well as in the native language of the north, Tamil. Eastman took charge of the printing press, type foundry, and bindery – and a workforce of more than seventy, who labored in double shifts to meet the demand for printed scripture and tracts (literary pamphlets). Each year, eight million pages of the Christian message were produced for the eight stations, an indispensable adjunct to the Mission’s preaching, schools, and hospitals. In 1841, Eastman began overseeing the publication of a semi-monthly, bi-lingual, general interest newspaper, the Morning Star, founded by two missionary-educated Tamil men. In Ceylon, Lucy Minor gave birth to two children, William Chester Minor, born in June 1834, just months after the Minors’ arrival, and his sister Lucy, born in 1836. The following year, Eastman was widowed, Lucy Bailey Minor having died of pulmonary disease on 29 June at the age of twenty-eight. The widowed Eastman Strong Minor set off on a journey through the Malay peninsula with the sole aim of finding a new wife among the mission communities. He met Judith Manchester Taylor, a New Yorker who had gone out to the Siam Mission – as an unmarried twenty-five-year-old – under the auspices of the American Board in July 1839. After a brief courtship, Eastman and Judith were married on 18 December 1839 and returned to Manepy, where Judith learned Sinhalese (the language of the largest ethnic group in Ceylon) and ran the local school. At least six of the couple’s eight children – half-siblings of William Chester Minor – were born at Manepy. In 1851, either while Judith was expecting or shortly after the birth of James, the couple’s seventh child, Eastman’s ill health forced the Minor family to return to New Haven, Connecticut. He opened a china and crockery shop and became a prominent merchant in the city. The couple’s eighth child, a daughter Mary, was born in July 1853. The 1860 federal census offers a snapshot of the Minor family in New Haven: Eastman and Judith are living with seven (of the ten) children, including William, who was then twenty-five. It also shows, by omission, changes to the family. Lucy Minor, born to Eastman and his first wife, Lucy, had died in 1857 at the age of twenty-one. Two sons who are also not enumerated – Charles, born in 1847, and James, born in 1851 – had both died in 1852. A year after the census was taken, the youngest child, Mary, died at the age of eight. William, who had graduated from Yale University with a medical degree in early 1863, promptly joined the Union Army as a surgeon and by May 1864 was at the front lines of the devastating encounter now known as the Battle of the Wilderness, an experience that Mr. Winchester contends haunted Minor and contributed to later events (but you will have to read the book). On 16 June 1867, after years of ill health, Eastman died at the age of fifty-seven. His obituary noted that his death, from pulmonary disease contracted in Ceylon (missionaries and their families were plagued by health issues), had long been expected. 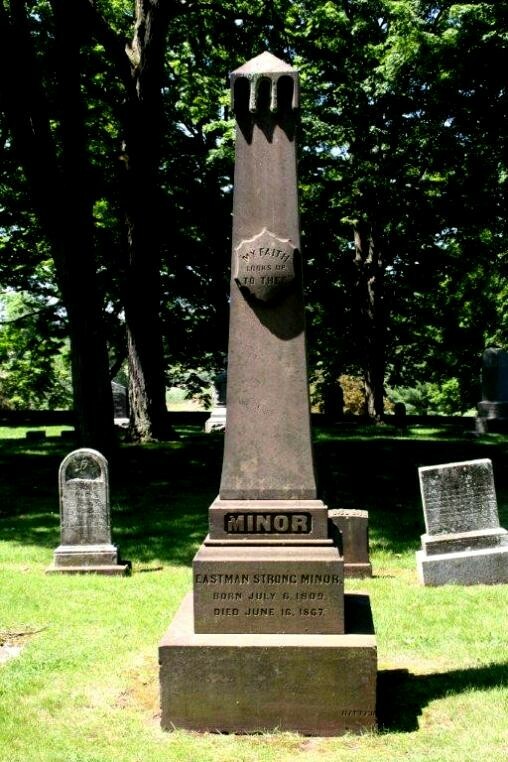 He was, according to the obituary, “one of the most upright and conscientious of men, and enjoyed the fullest confidence of the community.” Two years later the Minors’ fourth child, daughter Ellen, born in 1845, died. William’s circumstances, beginning with his arrival in London in the fall of 1871 and the shocking event of 17 February 1872, are at the heart of The Professor and the Madman. The 1870 federal census enumerates Judith, her two oldest children, sons George and Alfred (who took over the crockery business and ran it until 1886), her youngest surviving child, daughter Jane Elizabeth (Jennie), and a sister-in-law, Elizabeth, living in the household. William’s circumstances, beginning with his arrival in London in the fall of 1871 and the shocking event of 17 February 1872, are at the heart of The Professor and the Madman. Jennie Minor was married on 31 May 1873 in New Haven to the Rev. John Scudder Chandler, born to missionary parents in Madura, India. That fall, Judith Minor sailed with them to Madura, where she served for twelve years as a Bible reader. Upon her return to New Haven she lived with her son Alfred. Jennie also returned from India and settled in Newton, Massachusetts, where she died of tuberculosis in April 1886. She was thirty-six and had given birth to her sixth child just two weeks earlier. Three years later, in December 1889, Judith received news that her son Thomas, a distinguished citizen and former Mayor of Seattle, had died at the age of forty-five in a boating accident. Bereaved of her husband, six of her eight children and her step-daughter Lucy, Judith died in New Haven in March 1900. She was survived by sons George (1840–1925) and Alfred (1842–1915), and her step-son William (1834–1920), though her various obituaries made no mention of William. 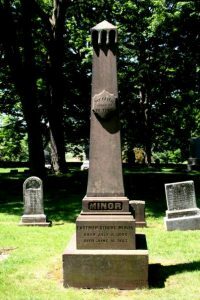 Many members of the family, including the infamous William Chester Minor, rest in New Haven’s Evergreen Cemetery. In an interesting footnote to the Minor family story, it seems that Thomas Minor the immigrant, eager to document the origins of his surname and determine whether it was spelled Minor or Miner, was provided with a pedigree asserting that one Henry Miner, from whom Thomas descended, had been given a coat of arms by Edward III. The original document was published in The New England Historical and Genealogical Register and for nearly three hundred years the Miner family coat of arms and pedigree were accepted as fact. That is, until 1979 when descendants traveled to Chew Magna for the 350th anniversary celebrating Thomas’ departure from England. (Prior to Robert Charles Anderson establishing that Thomas Minor had emigrated in 1632, accounts had him arriving in 1629 – thus the anniversary.) Anticipating that the Miner family coat of arms would be displayed in the church where Thomas had been baptized in 1608, the honor was delayed pending further investigation by the College of Arms. The outcome of the investigation, The Curious Pedigree of Lt. Thomas Minor, was published in the Register in 1984. Robert Charles Anderson, The Great Migration Begins: Immigrants to New England 1620–1633, 3 vols. (Boston: New England Historic Genealogical Society, 1995), 2: 1262–67, 3: 1379–83. “Ancient Burial-Ground at Stonington, Conn.,” The New England Historical and Genealogical Register 13 : 23. For those with access to JSTOR (many libraries, including the Boston Public Library, offer access with a current library card), please see Virginia Dejohn Anderson, “Thomas Minor’s World: Agrarian Life in Seventeenth-Century New England,” Agricultural History 82: 4 : 496–518. Benjamin Woodbridge Strong, The History of the Descendants of Elder John Strong of Northampton, Mass. (Albany, N.Y.: Joel Munsell, 1871), 737. Robert Charles Anderson, The Great Migration: Immigrants to New England, 1634–1635, 7 vols. (Boston: New England Historic Genealogical Society, 1999–2011), 6: 581–88. Rev. William W. Howland, Historical Sketch of the Ceylon Mission, in American Board of Commissioners for Foreign Missions 1865, 14. Also see at JSTOR, Katharine Smith Diehl, “American Printers in the East Indies through 1850,” The Journal of Library History 21: 1 : 202–14. Find A Grave, Evergreen Cemetery, New Haven, Conn.
 “An Herauldical Essay Upon the Surname of Miner,” Register 13 : 161–64. John A. Miner and Robert F. Miner, “The Curious Pedigree of Lt. Thomas Minor,” Register 138 : 182–85. I loved that book too. Thanks for supplying this additional information! I agree Professor and the Madman WAS a fantastic read! I think I read it when it first came out and was enthralled. Who’d a thunk a book about one of the main contributors to the OED was an American medical doctor and murderer. It is interesting to know his family background. Spoiler alert! Even so, it’s clear that my husband and I need to add this book to our reading list. You have written a fascinating genealogical story and temptation to read the book. I’m going to try to find it. I do know about the rolling eyes of those you so enthusiastically recommended it too. A couple of years ago I read a book on punctuation (Confessions of a Comma Queen) that was so entertaining that I sometimes laughed out loud, and I read it again right after I’d finished it. When I recommended it to my sister, she looked at me like I sprouted an ear on my forehead. The way you’ve written this has definitely encouraged me to read “The Professor and the Madman”. I just loved the book, but never connected the dots!! I am a Minor and a Palmer. I even have Walter Palmer form bench from the 17th Century!! This is just great. I will have to get this book, since it is a story of a “cousin.” Like Eastman Strong Minor, I am also descended from Elder John Strong. Can’t wait to read it! I am setting aside this article and going out to get the book. Thank you! Well written! I also descend from Thomas Minor and Walter Palmer. And of added interest to me is that I graduated from Kodaikanal International School in Tamil Nadu, India. We had students from Congregational missionary families (Lockwood, i.e.) from Sri Lanka as well as those from the famous Scudder missionary family of India and Kuwait. — a 6C of President U.S. Grant. — a 6C1R of John Davison Rockefeller (1830-1937), LDS Pres. Heber Jeddy Grant, Ohio Gov. Jacob Dolson Cox. — a 6C2R of U.S. Sen. Wallace Foster Bennett. — a 6C4R of U.S. Rep. Lane Allen Evans. And so many more, of course!